Tylt’s Cord Noir Lightning cable is exactly what a premium cable should be: Beautiful, sturdy, and uber-convenient. The most notable feature of the Cord Noir Lightning cable is its reversible USB plug, which lets you plug the cable into a computer or power supply without having to worry about double-checking that it’s facing the correct way. Amazing, right? Reversible USB Type-A connectors aren’t new, but they’re relatively rare in charging cables. This might be because they’re more delicate, internally, than their non-reversible counterparts—instead of pins on a piece of plastic wedged against one side of the plug, these connectors have a thin sheet in the center with pins on both sides. Still, if you’re the kind of person who likes to plug cables in in the dark, this is basically a game-changer. 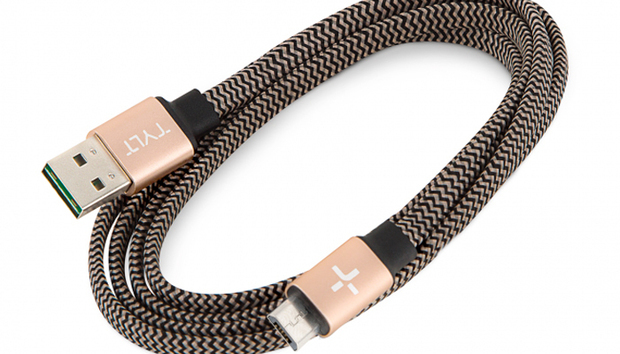 The reversible USB connector isn’t the only thing Tylt does right in the Cord Noir cable. The Cord Noir is flat instead of round; flat cables are nice because they’re very flexible (without putting as much strain on the cable’s neck) and easy to fold up for travel. 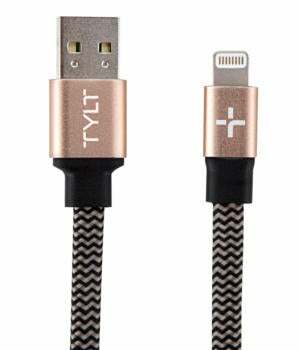 The Cord Noir comes in two colors (gold and silver) and one length (4 feet) and is wrapped in durable double-braided nylon. The Lightning connector and the USB plug are housed in sturdy plastic and finished with brushed aluminum accents; the Lightning connector’s housing is thick but shouldn’t give you any troubles with snug phone cases. The Cord Noir Lightning cable costs $30, which is pretty expensive for a 4-foot charging cable. But it’s definitely worth it as a luxury option—the flat nylon-wrapped construction, aluminum accents, and reversible USB connector are all totally valid reasons to buy this cable.